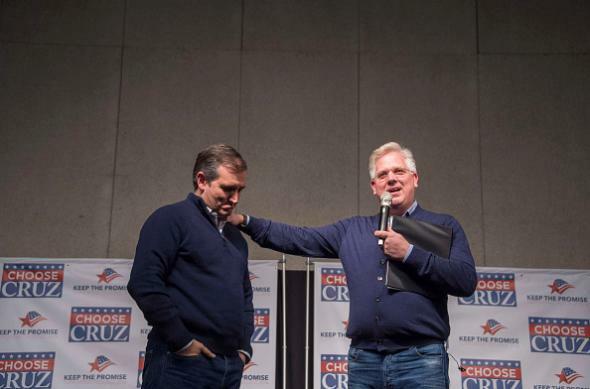 Ted Cruz and Glenn Beck agree that sweaters should be dark blue, but do not agree on the question of whether they should be buttoned or zippered. Last week Republican presidential candidate Ted “T-Bone” Cruz complained in New Hampshire that he was uninsured because of Barack Hussein Obama’s sinister Affordable Care Act. Mr. Cruz had in fact been automatically enrolled by Blue Cross and Blue Shield of Texas in another, narrower-network “health maintenance organization” plan that kept him covered in January. A Cruz spokeswoman confirmed the candidate never lost coverage and said he had “believed the family was uninsured” because of information he’d been given by Blue Cross.